WILLOUGHBY: I thought you were supposed to be writing The Hankie Award piece. You’ve been staring at it for six days. E.J. : I have writer’s block. W: Really? This wouldn’t have anything to do with you being on the phone four hours a night for the LAST THREE NIGHTS, would it? W: Are you lying to me? E.J. : He was a really good kisser. E.J. : My ex? God, that’s such an ugly word…”ex.” It always reminds me of ex-lax. W: I think I ate some of that on our walk earlier. Or this conversation makes me want to barf. Excuse me for a minute. E.J. : You know…the kind of kissing that makes your knees go weak and your thighs go up in flames? W: I wouldn’t know. I’m neutered and I don’t have knees. E.J. : You’d like him. He’s wickedly funny. Except he tells knock-knock jokes. W: Like “Why did the chicken cross the road?” Excuse me. Barfing, Round Two. E.J. : Hey, your tail was wagging in your sleep again last night. That’s so cute. What were you dreaming about? W: Us never having a conversation about kissing – or thighs – again. Unless it’s chicken thighs. You’ve scarred me for life. E.J. : For life? That’s a little dramatic. Besides, this is exactly what women and gay men talk about. You’re getting an inside scoop. W: I think I need an outside scoop. 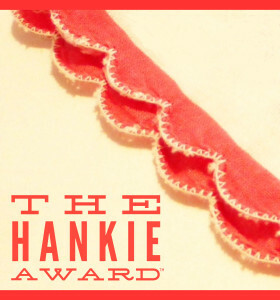 And when we get back, could you get your schtick together and finish The Hankie Award piece? Someone has to bring home the bacon. P.S…speaking of Bacon, Nancy sent me this VIDEO the other day. It’s the funniest thing I’ve ever seen in my life. Except don’t ever do that. E.J. : Since when are you and Nancy e-mailing? W: Since the flat screen went down last week. Have you ever seen THE GRAPE STOMPING LADY? I don’t want to laugh. But the look on the reporters’ faces at the end gets me every time. E.J. : I know. It’s wrong to laugh at people when they fall. At least that’s what those people tell me. Hey, wanna watch STEWIE DO THE GRAPE STOMPING LADY? W: I love you, woman.